Doug Fieger, lead singer for the power pop band The Knack, who co-wrote and sang the massive No. 1 hit My Sharona, died yesterday at the age of 57. Fieger passed away at his home in Woodland Hills, California, after a lengthy battle with cancer. His sister, Beth Falkenstein, said, "He was an extraordinary lover of all things popular culture. He was an eternal pop teenager but highly intellectual and intense." A Detroit-area native, Fieger formed The Knack in Los Angeles in 1978, and the group (which then also included drummer Bruce Gary, guitarist Berton Averre and bassist Prescott Niles) quickly became a sensation at various Sunset Strip rock clubs. 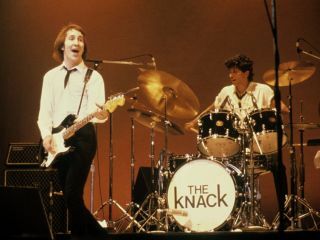 My Sharona, the lead single from the band's debut album, Get The Knack (recorded for just $18,000), was inspired by a former girlfriend of Fieger's. "I had never met a girl like her - ever," he told The Associated Press in a 1994 interview. "She induced madness," he continued. "She was a very powerful presence. She had an insouciance that wouldn't quit. She was very self-assured. She also had an overpowering scent, and it drove me crazy." My Sharona, with its mammoth drum beat and infectious guitar riff (it even had an extended solo section, rare for radio singles at the time), was released during the waning days of disco, and it held the No. 1 spot in the US for six weeks. The Knack were signed to Capitol Records, home to The Beatles, and they were heavily promoted as the "new Fab Four." The group even played Carnegie Hall during their first national tour - just as The Beatles had done on their maiden voyage to America (see video below). But The Knack could never repeat the success of My Sharona, and subsequent releases stalled on the charts. The group disbanded in 1982. A 1991 reunion yielded the album Serious Fun, which also failed to sell. Drummer Bruce Gary died in 2006 of lymphoma. Averre and Niles continue to tour as The Knack, and on their website, Knack.com, they paid tribute to Fieger: "Our hearts are broken, we will miss you Doug."